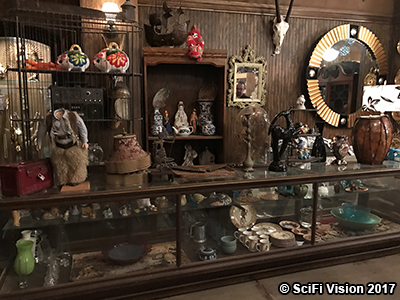 At the end of January, SciFi Vision was lucky enough to be invited to a press day for a Midnight, Texas set visit in Albuquerque, New Mexico. The upcoming NBC series is based around Charlaine Harris' book series. On the second day in Albuquerque, I came downstairs, and there were a couple journalists milling around, but I had gotten there fairly early. 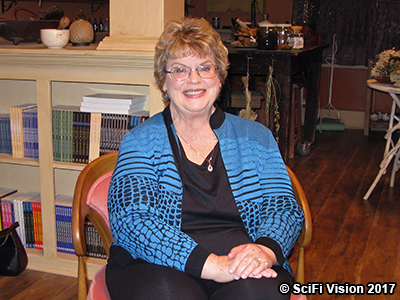 I chatted with Charlaine Harris while waiting to leave for the set. She was a delight. We departed the hotel early afternoon. Before getting to watch filming or doing interviews, we ate sandwiches in one of the trailers outside. After, we were again split into groups. 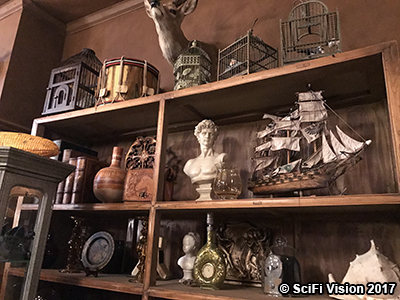 Our group first went inside a sound stage to the interior set of Fiji (Parisa Fitz-Henley)’s shop, Inquiring Mind, where we were joined by Charlaine. It was great to get to pick her brain about creating the story and characters that the series is based on. 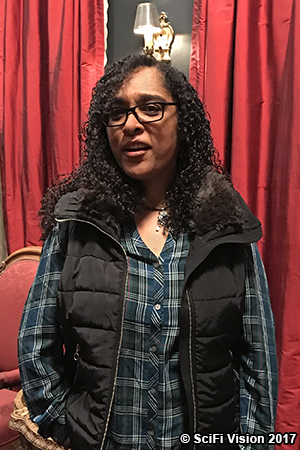 The writer talked about her inspiration and reasoning for writing the series. “When I came to the end of the Sookie series, I was casting around for what I wanted to write next - obviously that was a big hole to fill. I didn’t want to commit myself to a long series, because thirteen years, that was a much larger commitment than I ever thought I would make. “So, I thought, ‘I could write a trilogy; I could do that.’ I was thinking about the summers I spent as a child. My mama was Texan, and we went to Rock Springs, Texas every summer to help our grandmother during the rodeo. She owned a hotel. The hotel was always full, in this tiny town, and most of the people in it were drunk. [laughs] So, my mother came to help her mom, and her two sisters, came to help to change the sheets, and generally, keep order, which was not always easy. 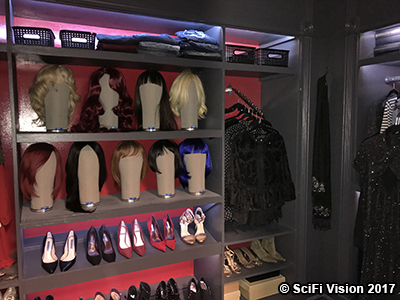 Next we moved onto the interior of Olivia (Arielle Kebbel)’s apartment, but not before stopping to take photos of the set we were in. 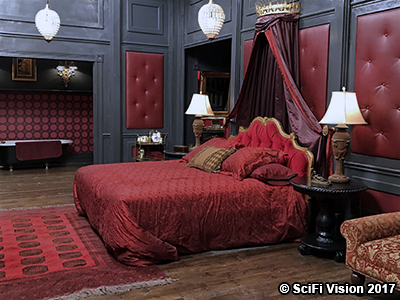 Olivia’s place was one of my favorite of the sets. The rooms were very rich and lush. I explored and took photos of the different rooms in between interviews. While in the apartment, we first talked to executive producers/showrunners Monica Owusu-Breen and David Janollari. Monica talked a bit about how the show will balance its overarching mythology and standalone stories of the week. “Fringe did this thing called the 'mythalone,' which is my favorite thing. It means that each episode has a beginning, middle, and end, but combined you tell a story. And for me, it was really important to be able to come into an episode and be able to follow and have fun, but at the same time, if you watch the whole season, it’s better, [laughs] and it adds up to something. And by the end there’s a story that you’ve built to the entire season. David added, “When we started to figure out what the series was and what part of the three books to focus on for the big season arc for the first season, we kind of came up with the mantra of three engines that should run through each episode. One is, 'What’s Manfred (François Arnaud)’s story? What’s Manfred’s journey?' He’s the centerpiece; he’s the new guy in town. So, every episode furthers understanding or the drive of him coming into his own. “The second thing is, 'What is the thread of the week? ', whether it’s something coming from the outside or something within our town. In the pilot, you have the opening of the thing under the floor, which tends to become one of our bigger season arc things, as well as who killed Aubrey, and how do we solve this mystery? Next all the groups sat down for more of a conference style of interview with SPFX Makeup Department Head Justin Raleigh and Costume Designer Daniela Moore. The two talked about some of the difficulties working on the show. According to Justin, "For us, it's time frame always. It's television, so it's a fast-paced schedule as opposed to a feature film, where you have months to develop something. With this you have a week, weeks if you're lucky, to develop something. "With what we're trying to do, we're really trying to push the envelope of what you would see prosthetically for a network show. 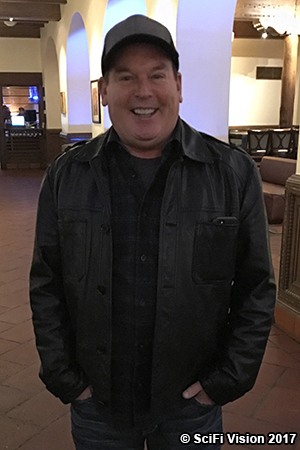 So, a huge challenge for myself and my team back in Los Angeles and my team here in New Mexico is, just how do we come up with something unique, really well done, and feature quality in a short time frame?" Daniela agreed, but had something to add. "I think our biggest challenge is finding clothes that fit Peter Mensah, because they don't make clothes that fit Greek Gods. [laughs] He's got very long arms and broad shoulders, so that's kind of a challenge, but also time frame, you know, for every department, that's difficult." Justin talked a bit about the design of the dead. "For the pilot episode we had multiple conversations and went through multiple forms of reference from actual forensic reference of what a dead body would look like, and we came to just kind of a generalized ghost sort of [skin] tone. It's a dead pale pallor with a little bit of translucency to it. They have contact lenses. It’s nothing that horrific, where they looked like they were decomposing on camera. There is also a visual effect element that goes with them as well, so they'll have a different ethereal feel to them. So, the makeup was also augmented by VFX at that point." Daniela talked about how conventional or out there they needed to be for the costumes. "All of the clothes I think have to be believable for these people. They still live in a small town in Texas, and I think there are certain characters where we can push the envelope a little bit more, like with Lem (Peter Mensah) and Olivia, but you do sort of have to restrain yourself, and remember that they do still live in a small town, and it's not all completely fantastic costumes." Back in Olivia’s apartment once again, our group was joined by Arielle Kebbel, who plays the human assassin, as well as Lem’s lover, Olivia herself. On the way in, she asked us to take a video of her entering, and she took one of all of us as she walked in. She also commented on Olivia’s fantastic wardrobe. “When I walked in, when I saw Olivia's apartment, I wanted to move in. I was like, 'Oh my God; she's so much cooler than me. I love her.' She has the queen bed, which is fabulous, and then her one closet is full of her armory, and the other is every shoe, wig, and dress under the sun. 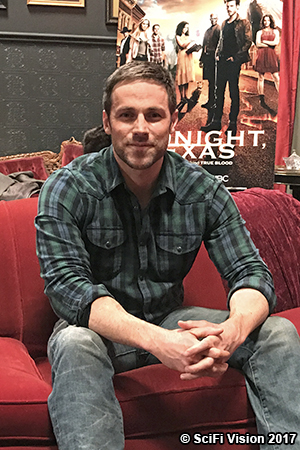 Next Dylan Bruce, who plays pawnshop owner Bobo Winthrop, joined us in the apartment. Among other things, he also talked a bit about his character’s backstory and mentioned how some of it is different than in the books. “What makes him interesting to me, is that Charlaine mapped out a great backstory for him in the books, and he’s actually in a different series of hers as well. He was a teenager in her Lily Bard series, which I think is owned by a different studio, but I did read those books as well. So, it’s nice to have the groundwork laid out for you instead of making stuff up. “Bobo comes from a very interesting background. He’s a good ole boy from Shakespeare, Arkansas. It’s a fictional town that Charlaine made up. And he’s got a very interesting family as well. His family is kind of in line with the Waltons, the people who started Walmart, so he comes from extreme wealth. He was a very sheltered golden boy, and then something tragic happened in his past, which propels him on the trajectory that he’s on now many years later, arriving in Midnight. Then it was time for us all to walk to the set of the town. We were told that for the pilot they filmed on a real street in Las Vegas, New Mexico, but after the series was picked up, they recreated the street on the back lot behind their stages. We explored the town a bit and headed into Video Village. 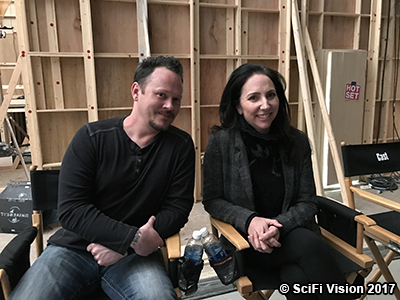 We sat in the restaurant/bar location, Home Cookin’, with Monica while they filmed a scene, which we watched on the monitors. We also while there chatted with Bernando Saracino, who plays Chuy Strong, Joe’s husband. Bernardo talked about how the whole cast has felt like family. "I think the way we bonded as a group has been kind of surreal for me and kind of new, because every single person has something amazing to offer. I honestly feel like a family. "So, now, shooting the last episode, I'm kind of depressed, because we're almost done. It's like 'Where are we all going to go?!' It's like being home for Christmas, and you all have to go your own way again. It's been a great experience." Everyone in Midnight seems to be running or hiding from something. "What I love about the show, where I'm able to relate to Chuy, is everybody's running or hiding from something more internal than external. I think it's kind of the human condition. So, I think how I resonated with Chuy, whether he's hiding or if he's running or if he's just in love, is what he's more doing is seeking something inside of himself, as opposed to hiding from something externally, which I think is kind of what most human beings are doing. It takes work to get to that point. 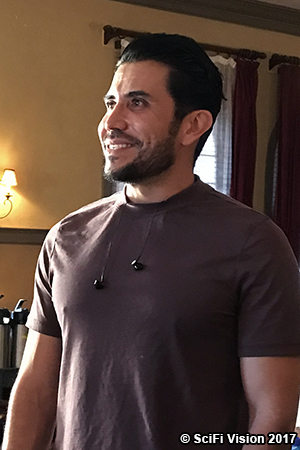 "What I love about Chuy, is it's important to go through that with him, and as each episode goes, as we get to know him better, [viewers] will realize what he is running from, what he is hiding from, and what hasn't been explored internally yet. I love our writers, because they've done that and allowed us to see that progress every episode." He also talked about the yin and yang between Chuy and Joe. "Joe's a tattoo artist. Chuy's a manicurist by profession, and I would want to say if they were [yin and yang], Chuy's very zen. I think he meditates a lot. I think he spends a lot of time internally focusing on love, focusing on goodness, and so does Joe. "In their relationship, Joe is a little bit more of a hothead than Chuy is. I think the nature of Chuy's character, is he's forced to stay grounded, simply by whom he is and his past experiences. Joe can lose his cool much easier than Chuy can. The nature of who Chuy is, is he can't afford to lose his cool." While on the back lot we were able to explore different areas of the town, including Home Cookin', of course, which seemed to have some random props lying around in it, the church and grave yard, which had some cute injokes on the gravestones, and the store fronts without interiors, including Strong Angel Tattoo, Moonlite Welding, Manfred’s house, Midnight Pawnshop, Maggi’s, and Plumbing Supply Company. There were also a couple extras walking around. As they were filming the town during the season finale, these photos will not be available at this time. 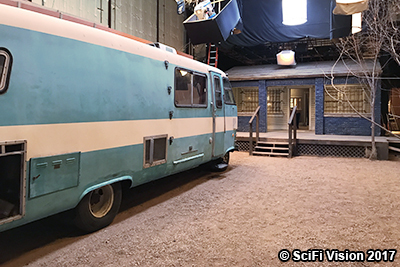 Next we went back onto the soundstage where we saw Manfred’s RV as well as his house. I for some reason didn’t realize it was more than a porch and missed going inside, however. Last was my other favorite set, Paul’s pawnshop. Across from it was a curtain with an image of Home Cookin’ on it so they could shoot out the door. The “building” of the shop also had part of the exterior on it, with the front windows with signs. 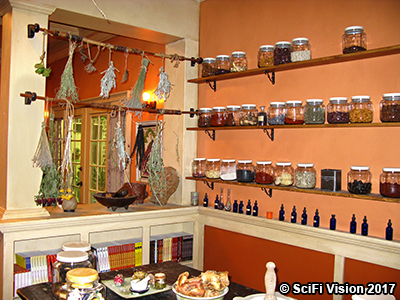 There were so many cool oddities inside the shop; I tried to take photos of everything. In the back of the shop was Bobo’s office. Oddly there was a creepy baby carriage inside. 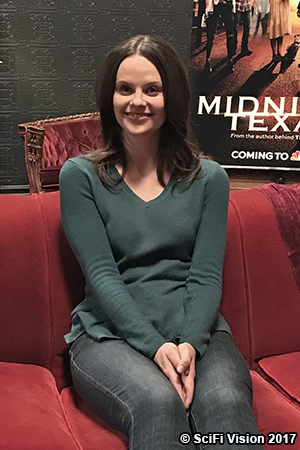 Before leaving, our group went back into Olivia’s apartment where we first talked with Sarah Ramos, who plays Manfred’s love interest, Creek. 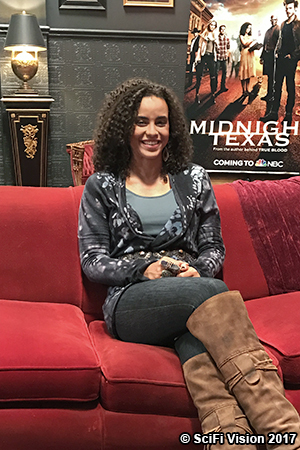 Lastly, we talked to Parisa Fitz-Henley, who plays local witch Fiji Cavanaugh, who has a crush on Bobo. She first talked about the physicality of Fiji’s magic. “Fiji really believes that science and magic are pretty darn close together, if not the same thing. So, looking at things from that perspective is something that I also do. I have thought about how, over two-hundred years ago, things that would have had people burned at the stake, in particular, women burned at the stake, are things that we accept as the most natural, like making a cup of herbal tea for somebody, and ‘Oh, they feel better!’ It seems super normal and sweet now, but there was a time when people were like, ‘Why did that happen?’, because the doctor couldn’t do it. “So, I’ve looked at this magic thing as a connection to nature, a connection to my own body, and feeling the energy of something and trying to help channel it. “So, in the scene where they use my hand for something, I think about healers that I know in my own life, who really rely on the energy that we carry with us. I think about Qigong, which I love, and Tai Chi, and these practices of moving energy and channeling it. So, when we do spells, and when Fiji’s putting things together, I try to be mindful of those things when I’m doing them." Parisa also talked about Fiji’s struggles with her powers. “I think Fiji’s main struggle is knowing deep down inside, that she’s incredibly powerful, and she’s feeling that she doesn’t have the capacity to wield that power safely. I don’t think she ever doesn’t feel powerful enough, but I think when it comes to Bobo, for example, where I’m sure it would be really convenient to not have feelings for somebody that you don’t want to know about it, I think that she’d love to be able to kind of shut that down, but she doesn’t really have power over that. After that we drove back to the hotel and said our goodbyes.